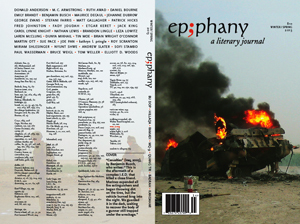 The winter/spring 2013 edition of Ep;phany: A Literary Journal is guest edited by poet Brian Turner. Not fooling around, Turner has solicited and selected quality work from a who’s who of contemporary war literature. A roll call of contributors begins with Benjamin Busch, Roy Scranton, Bruce Weigl, Donald Anderson, Matt Gallagher, Jehanne Dubrow, and Paul Wasserman. Turner’s also reached out internationally to include Israeli poet Etgar Karet, Myanmar poet Tin Moe, Irish author Fred Johnston, and others. the days began in the dark for pushups on fields of rock. chow, and set against other squads by barking sergeants..
Brian Wright O’Connor’s “Appointment at Bu Dop” explores his father’s service in Vietnam as the commander of an infantry battalion. The essay concerns itself with treatment of enemy dead and body counts, but Lieutenant Colonel Mortimer O’Connor is in the news this week for other reasons: he has just received a posthumous PhD in English Literature from Penn. He was weeks away from completing his dissertation in 1968 when he deployed to Vietnam, where he was killed in action.